In a generous and surprising nod to the Chicago School of Architecture, David Childs with Skidmore, Owings & Merrill has designed two sister towers in terracotta and glass for the former site of the Chicago Spire. Announced Tuesday night at a community meeting by developer Related Midwest, renderings for the development show two towers rippling upwards, set upon a masonry base resembling a rectangular photo carousel. Taking inspiration from some of the cities’ most significant buildings, Childs has covered the towers in a familiar architectural form–the Chicago Window–with setbacks allowing for pivot after pivot of the form in various multiples as the building reaches higher. Glazed terracotta became a way for turn-of-the-20th-century Chicago architects like Louis Sullivan, Daniel Burnham and William Le Baron Jenney to craft ornament that could be designed to exact specifications and made hollow, allowing them to decorate the tops of buildings. ﻿ Topping off at 1,100 feet, the south tower will be constructed adjacent to the riverwalk and will offer 300 condominiums and a 175-key hotel. The north tower will offer 550 apartments and will be aligned with the Ogden slip, at 850 feet tall. A shared podium will provide pedestrian and vehicular accesses for both towers. Parking will be delivered via four underground levels. In addition to luxury offerings, Related Midwest has committed to realize the completion of a long-awaited public park on a rectangular piece of vacant land, separated by Lake Shore Drive. The creation of DuSable Park will honor the legacy of Chicago’s founder, Jean-Baptiste Pointe DuSable, and realize the vision of Mayor Harold Washington for public space atop what was once a site contaminated with thorium from the manufacture of incandescent gaslight mantles. Plans for the development, currently known as 400 North Lake Shore Drive, do not specify how the construction will address what remains of the Chicago Spire, a 78-foot-deep, 104-foot-wide underground cofferdam that sits below what will be the south tower. Construction of the towers is anticipated to take four and a half years. Developer Related Midwest has announced plans to construct two skyscrapers on the former site of the Chicago Spire, with Skidmore, Owings & Merrill’s David Childs at the design helm. While renderings for the project have yet to be released, the Chicago Tribune reports that the site calls for two multi-functioning towers, each clad in glass with setbacks that taper towards the sky. Currently known only by its address, 400 North Lake Shore Drive, the project details are to be unveiled by Related Midwest on Tuesday at 7 pm during a community forum hosted by the Streeterville Organization of Active Residents at the Sheridan Grand Chicago. Thus far, the plans call for an 850-foot tower at the northern edge of the site along the Ogden Slip, and a 1,000-foot tower located at the southern edge of the site. The shorter tower will house apartments, with the taller tower to include condominiums and hotel rooms. Both towers will be located on a podium with building amenities. The high rises will take up more space on the site than the Chicago Spire originally called for. 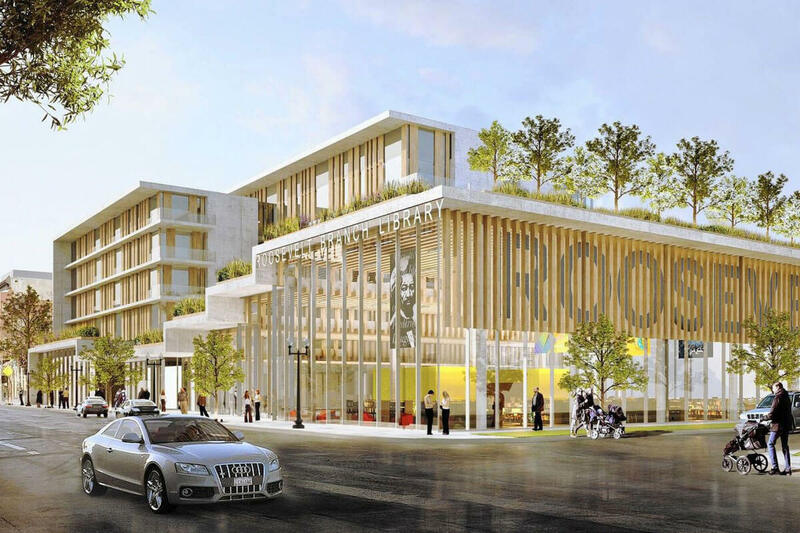 Along with the plan for the Spire site, Related Midwest has provisionally agreed to fund a portion of the construction of DuSable Park, a rectangular 3.3-acre parcel of land east of Lake Shore Drive. First dedicated as open space by Mayor Harold Washington in the 1980s, Related Midwest has not indicated if or how the park will relate to the towers. 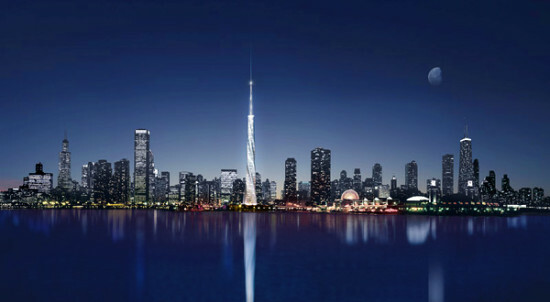 Most notably, Related Midwest has not specified how the construction will address what remains of the defunct Chicago Spire, now a 78-foot-deep, 104-foot-wide cofferdam over a decade old, the beginnings of a 2,000-foot unicorn horn shaped supertall building designed by Santiago Calatrava. If constructed as planned, the Spire would have been the tallest structure in the country. Related Midwest recently released renderings for a 62-acre Near South Side development they are calling "The 78," a serious of mixed-use, multi-phase structures built atop the largest undeveloped piece of land along the Chicago River. David Childs, a consulting partner in the SOM New York Office, is best known for designing One World Trade Center. Other work by Childs includes 7 World Trade Center, The Times Square Tower, and the U.S. Embassy in Ottawa. Chicago development powerhouse Related Midwest has hired former SOM architect Michael Pfeffer to head the development of the failed Santiago Calatrava Spire site, as reported by Crain’s Chicago. As vice president of architecture, Pfeffer will also lead the development of an epic 62-acre vacant site along the Chicago River in the city’s South Loop. Originally proposed in 2005, the Chicago Spire was set to be the tallest building in the western hemisphere. 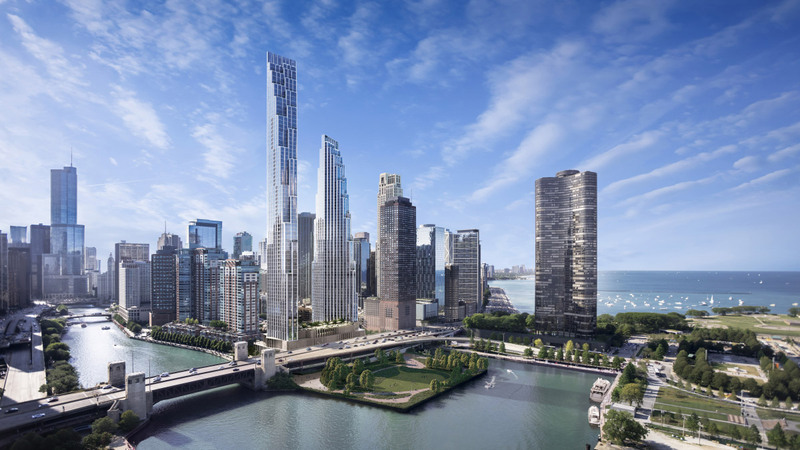 The 150-story, 2,000-foot-tall residential tower was to rise over Lake Shore Drive and the Chicago River, near Navy Pier. The initial design was unanimously approved by the Chicago Planning Commission and construction was started in June 2007. Early financial problems and the 2008 financial crisis proved insurmountable for the project, which stopped construction by the end of 2008. As the failed project's largest creditor, Related Midwest was given ownership of the property in 2014. 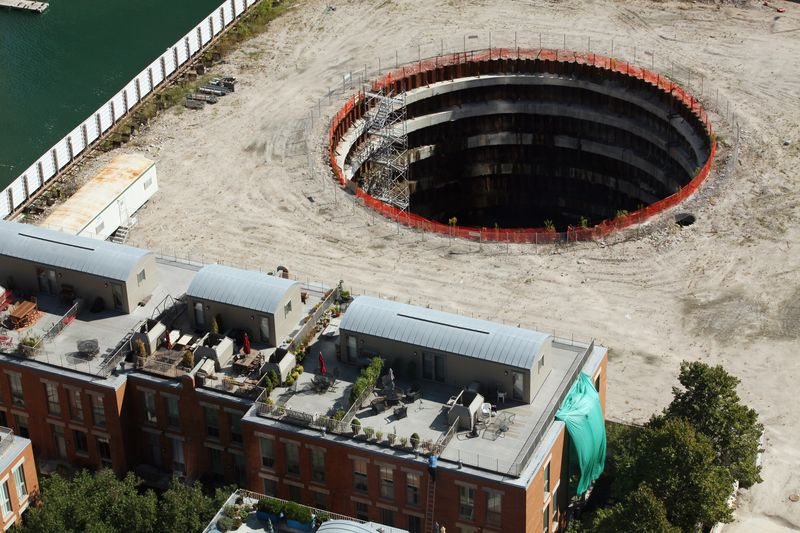 The site has laid vacant since 2008, leaving a circular foundation hole as the only evidence of the once highly anticipated tower. 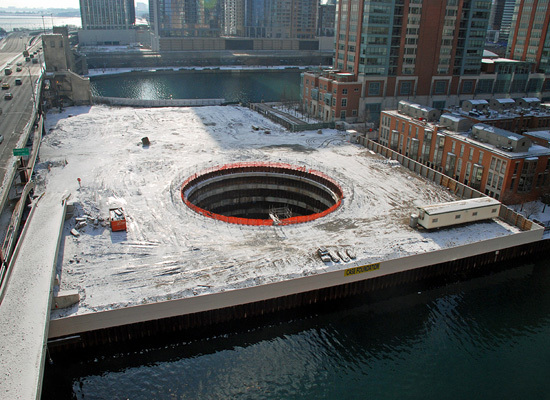 For the 2010 Chicago Prize Competition entitled MIND THE GAP, hosted by the Chicago Architecture Club, architects were asked to imagine novel uses for the 76-foot deep hole. Since then other architects have speculatively engaged with the site with proposals ranging from more twisting towers to giant urban swimming pools. The announcement of Pfeffer’s new role at Related is the first concrete indication that something might be happening at the site soon. According to Crain’s, designs for the Spire site and the 62-acre South Loop site could be released in 2017. The 62-acre site in the South Loop has also made headlines in recent years due to legal debates over money and ownership. The land's former owner is currently serving a prison sentence for fraud unrelated to the land. The site defines the western edge of the booming, residential development-dominated South Loop. With easy access to the downtown by road, as well as by water taxi, the area around the site is quickly being developed. 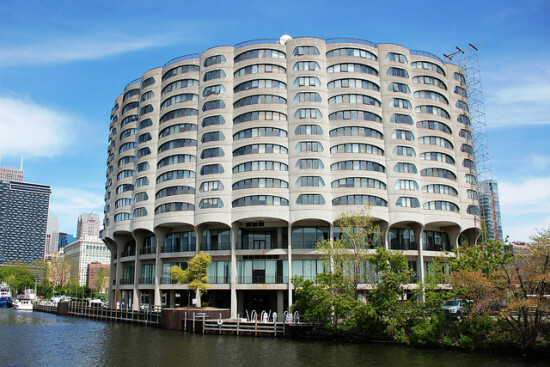 Related Midwest is responsible for developing many of Chicago’s most visible recent projects, including the mixed-income Lathrop Homes redevelopment, the Robert A.M. Stern-designed One Bennett Park tower, and the 500 Lake Shore Drive tower. Most developers did some serious belt-tightening during the recession, but news of a record-breaking real estate deal from late last year proves it sometimes pays to take a little risk. Related Midwest bought the concrete podium of an aborted development at Chicago's 111 West Wacker Drive in 2011, after plans for a Shangri-La hotel there went up in smoke. 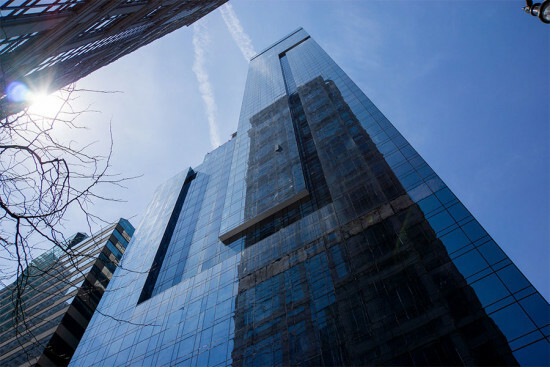 Chicago-based real estate investment firm Heitman reportedly paid roughly $333 million for the luxury rental building Related finished last summer, OneEleven. That’s about $661,000 per unit—a new high for a downtown apartment sale. This high-rise zombie lives, and it’s apparently very lucrative. For years Chicago’s celebrated architectural boat tour has started its journey at 111 W. Wacker, a 28-story symbol of the great recession and stalled real estate development. Now they are one step closer to a launch more fit for neck-craning. 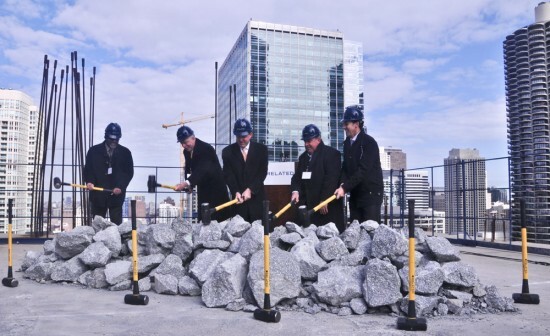 Construction workers broke ground Thursday on the dormant project once again, reviving the high-rise once intended as the first Shangri-La Hotel in the United States. The 950,000-square-foot Waterview Tower will reach 60 stories when completed in the Spring of 2014, housing 504 luxury rental units and more than 400 parking spaces. There will be ground-floor retail and a restaurant. The tower stalled in 2008 and developers Related Midwest scooped it up in July 2011 through a distressed real estate fund. Related has been busy lately, announcing work on projects including 500 North Lake Shore Drive, the Lathrop Homes, and roughly half of the built and unsold condo units in the South Loop. Alderman Brendan Reilly and Commissioner Andrew Mooney of the Chicago Department of Housing and Economic Development joined Related President Curt Bailey for the groundbreaking. Construction will create 900 jobs, something union representative Tom Villanova said came as welcome news to construction workers who had been facing 25 percent unemployment.